113411 visits since Jan. 2007. Seashells must be stored in a way that allow to trace their data (origin, condition, collect date, etc.) back. - Writing on the shell: writing an identity number on each of the shell is the best way to keep the data. in that case, the identity numbers are stored in a registry (a paper workbook or a computer system) in which all the details for every identity number are provided. Most of museum uses this method. The problem is that it is not always easy to write on shells, sometime they are too small, some of them are too rough, etc. And people does not always want to spoil the shell with ink, especially with nice collectible specimens. - Having a label with the shell: The label and the shell must be kept together, the risk is to loose the label of the shell or to mix labels between shells. To keep both of them, place everything in a single container (a transparent box or a plastic zip is perfect for that). It is the best way to deal with small shell data. Do not use rubber band to maintain the label and the shell together as, when getting older, the band is going to glue on the shell itself. - No label, no writing: It is possible to work without label if the collection is small. In that case accurate photographs and measurements of each shell must be performed, then data are linked to the photograph, either on paper (e.g. verso of photograph) or on a computer system. Problems will start to rise when the collection is growing and if a lot of specimen of the same specie are kept with different data. - Keep shells away from light. - Keep shells out of dust and humidity. 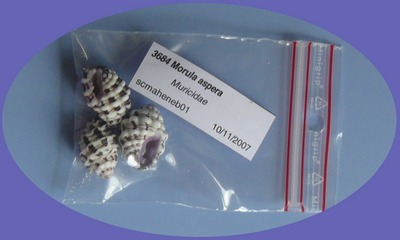 The set is stored in a transparent zip plastic bag together with a data label consisting in the ID number of the set, the specie name, the family name, the location code and the collect date. More information about the set is available in a computer database. Displaying goes against the storing rules. However, it is a pity to have nice shells without being able to show them. It is possible to display them for short period as long as they are out of reach of sunlight and dust. Use artificial and UV free lights (e.g. halogens) and switch the light off when displaying is over. Drawers are the best for this purpose because you do not have to handle the shells. Glass shelves is the nicest way to do it but the shells are more exposed.